A log term goal of mine is to hike a large section if not ALL of the Appalachian Trail. Today, with my father and two youngest kids, I spent about 6 hours hiking part of the KIillington Vermont section of the trail. I'm sore, but proud. We made memories and burned a TON of calories and I renewed my excitement for the goal. All in all a good day. Great picture - are you camping? All of my grandparents were living up in the Appalachian Trail. When I was growing up, I never saw the significance of the history of the Trail. However, I do now. Oh man, what I missed as a kid! 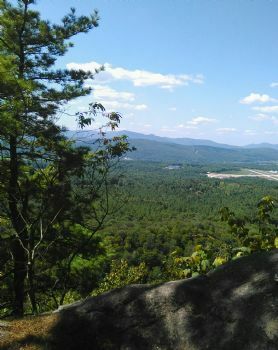 I love the parts of the Appalachian Trail I have hiked here in Maine, and the climb to the top of Mt Katahdin is beautiful. I have always wanted to hike the whole thing but so many parts of it are now not in the wilderness. That is a dream of mine. I'd love to hike the Appalachian Trail. I don't even care where I start. It would be an awesome feat to do it. Great job burning those calories and getting gin your steps. Take a nice hot bath and drink a nice cup of green tea with a hint of honey.